Leash Burns? You Mean Free Hand Tattoos? I have used a variety of different leashes from nylon to retractable (grr) throughout my dog walking career. Nylon tends to be the go to for most pet parents, which is understandable due to the fun colors, affordability and are easily purchased from any pet store/ big box store. Most of the time a nylon leash will do the job but my biggest complaints are the terrible leash burn, lack of grip, and they fray like crazy. To avoid any chances of dropping a leash I tend to use my own leather leashes for most of my clients now. 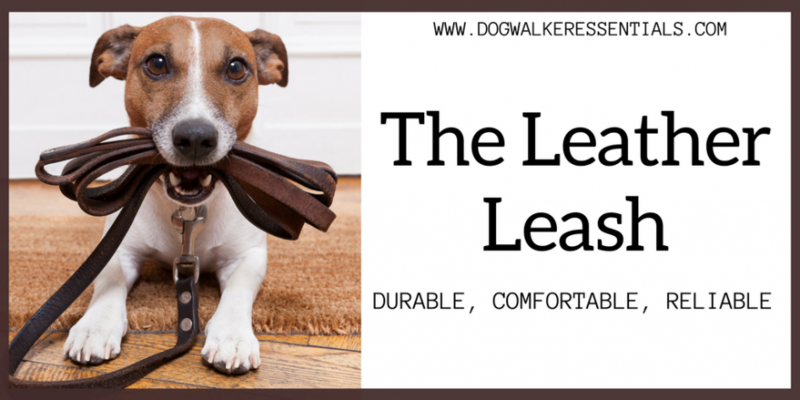 I know you may be tempted by the bright colors of the trendiest leashes or drawn in by the lower price tag of the store brand nylon leashes but take a step back, regroup, and read the reasons below for why you should ditch the nylon and use a leather leash! Leather leashes are not impervious to chewing but are extremely strong compared to nylon. There is nothing worse then a ragged, frayed and holey nylon leash. Fun fact: I still use a leather leash I bought back in 2008 and it is literally the softest leash I own. Lastly, a treated leather leash will stand up to all the elements and very rarely ever look “dingy”. Leather is by far more comfortable to hold, especially on long walks. Nylon can agitate the skin over time especially if you have a puller. The best part is as time goes on, the leather will soften more without losing its durability. Leather leashes are great for grip stability; a leather leash is less likely to slip through your hands when your dog pulls or lunges. Additionally, if a leather leash ever gets wet it does not become slippery like a nylon leash does. Most trainers will require or recommend a leather leash for control when it comes to obedience training. I personally think leather leashes look extremely timeless/ classy but if you are into the latest trend and bright colors, fear not they exist! Leather can also be customized; it can be stamped or even burned with designs. One of my favorite gifts to give clients is a leather leash with their pup’s name branded into the leather. For ease of handling and overall performance leather is the best dog walking leash you can get, hands down. Now that I have convinced you to invest in a new leather leash, check out some of my favorites below. The key to choosing a good leather dog leash is much the same as choosing any other product: buy the best that you can afford. Leather is like anything else: there are degrees of quality. My favorite is the Leatherberg– it is relatively affordable, extremely comfortable and comes with a 1 year warranty. Now if you are looking for a trendy, colorful leather leash then I really like the Logical Leather; I have the red one to match my logo and I use this for a lot my clients. The only downfall of the Leatherberg and Logical is they only come in the standard size (6ft & 3/4) and for the most part this size will accommodate almost every size dog. With that said, I have a toy poodle (7lbs, tiny) and this leash is a bit heavy so I use the Signature K9 5ft 1/2 wide leash and it is perfect for her. All three of these options come with heavy duty brass clasps and are relatively affordable. If you go to your local pet store leather leashes tend to be more pricey costing you more than $50 for basically the same product. If you simply do not like leather products then I recommend a cotton product like the Guardian cotton leash. Cotton is flexible, easy on the hands, and still a step up from nylon leashes. The price is reasonable, but the quality of the bolt snaps varies widely. Good-quality snaps are essential. If your training any type of recall or distance training then I recommend purchasing a thirty-foot leash, it gives you some distance without losing control. Forewarning- if this type of leash gets wet, they take forever to dry (cotton absorbs the liquid).